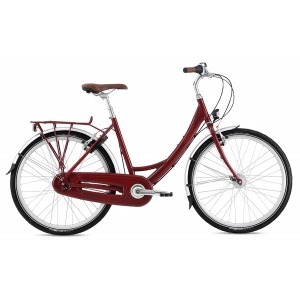 Breezer Uptown is a bike model specifically designed for urban commuting. The model comes in eye-catching colors and top-level specs to make getting from point A to point B in a city as breezy as possible. This model is well-recognized for offering comfortable transportation, almost like a car. Breezer Uptown has won Bicycling magazine’s “Best Commuter Award” for several years in a row. This level of recognition doesn’t come over nothing. This model is one of the best out there for commuting in cities. We know because we fell in love with this model while reviewing. The Uptown bikes are made from aluminum frames that weigh like feathers. The lightweight frame also comes in vibrant colors like cyan that you can easily show off to friends. Plus, the frame never rusts, so we could leave it out in the rain without worry. As far as specs go, this model comes with 26-inch wheels that were nimble enough so we could navigate those tricky street corners without a problem. The wheels are quite durable as well. The models we tested had a casing around the chain. It protects the chain from catching things like flying papers. Also, the chain case eliminates the risk of a denim hem or a skirt getting caught while riding through traffic. This bike model comes with up to 8 speeds. The ones we testes had convenient rear racks. The prices can vary depending on the model, but are usually in the mid range. If you are looking for a transportation bike model to commit to for a decade or longer, then Breezer Uptown should be your top choice. Not only is this model easy on the eyes, it’s also easy to navigate and take care of. This model comes with highly desirable specs like chain guards, no-rust frame and racks for stowing thing like bags as well.